The following is just a sample the pictures and articles in the 20 pages of issue #2. Built in 1911, 503 Bryan Avenue. 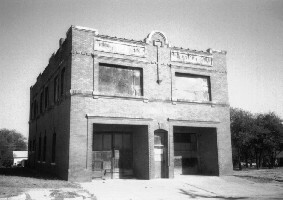 It is a two story brick and similar in appearance to Station #10 on Lipscomb Street. The station was sold by the city in 1982. When I drove by in January 1997, it looked like work was being done on it. Bessie This is Bessie? The picture was taken in 1952. I found this picture at a flea market and don’t know if it was in Fort Worth or not. Check out those prices. The following is just a sample the pictures and articles in the 20 pages of issue #1. Jim Courtright was one of the best known of Fort Worth’s early marshals. Longhaired Jim Courtright tombstone at Oakwood Cemetery. It happened in the year of 1887 on a cold and dreary February night. Trouble was brewing between Luke Short and the former city marshall, Jim Courtright. 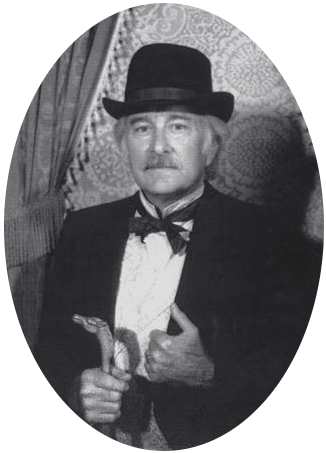 Luke Short, a noted gambler and owner of the White Elephant Saloon was called outside by Jim Courtright for a showdown that would be happening soon. Courtright, an excellent gunman, was fond of a saying “When Colt made his pistol, it made all men equal”, but Courtright was outdrawn, shot three times and killed in the following sequel. 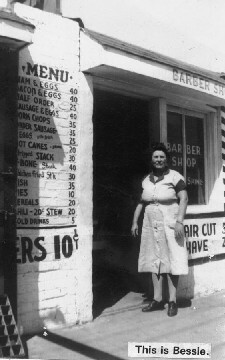 The Saloon was in the 300 block of Main Street just north of Hell’s half acre. It was the site of the great gunfight that sent Courtright to meet his maker. 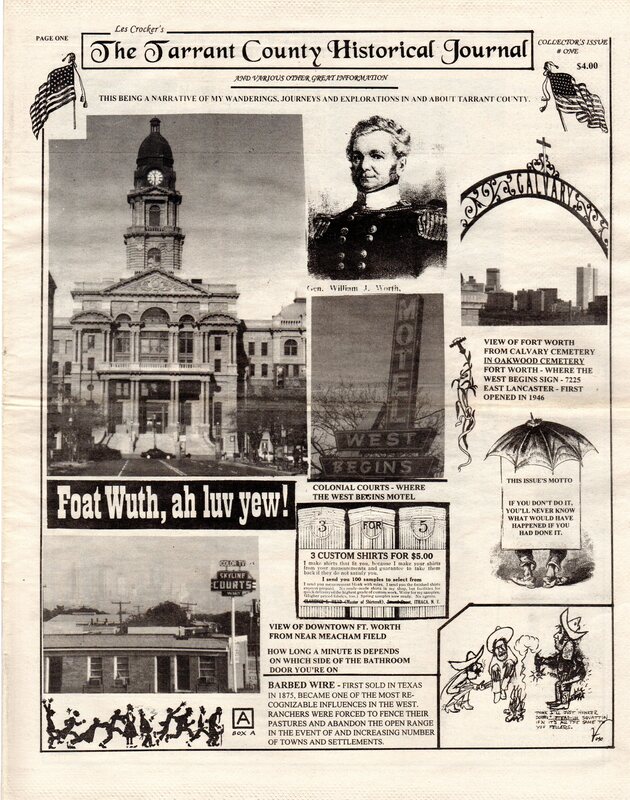 The citizens of Fort Worth took up a collection and gave Courtright the grandest funeral in this town that’s ever been. They held Short blameless. It was a fair fight as witnessed by all who had seen. Short died in the 1890’s and was buried in Oakwood cemetery, a stones throw from Courtright, the man he outdrew in 1887 in that notorious gunfight. 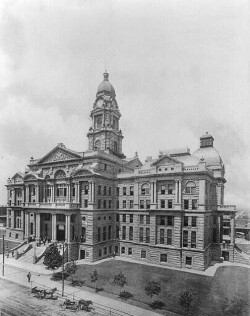 The Tarrant County Courthouse, completed in 1895. It was constructed at the price of $408,840. It was thought that this was too much to pay for a courthouse so the county officials responsible were thrown out of office. The courthouse is a four story building of red granite in Renaissance Revival Style. The walls at the base of the building are five feet thick. In 1843 General Edward H. Tarrant and General W. Terrell met at the abandoned Birds Fort in the northeastern corner of Tarrant County (then named Navarro County). They negotiated with the leaders of nine Indian tribes. This resulted in the signing of the "Birds Fort Treaty". The Treaty called for an end to conflict and established a line separating Indian lands from Territory open for colonization. 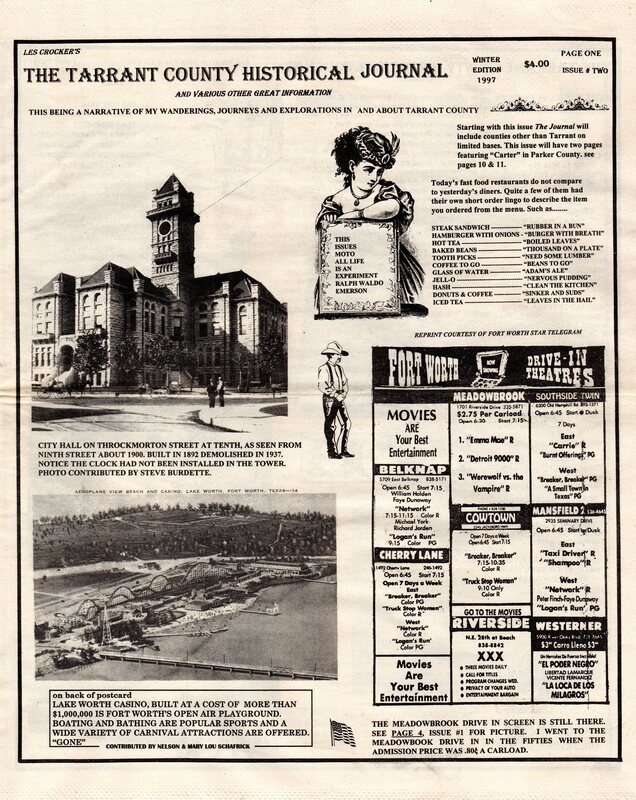 This is how Fort Worth became known as the city “Where The West Begins”. This photo was taken by me years ago. 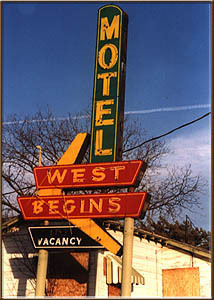 The sign and and motel are gone now. The past is fast slipping away.